In a new report published by the Consortium for Science, Policy & Outcomes and The Breakthrough Institute, the authors call for an improved framework for climate adaptation in the 21st century. 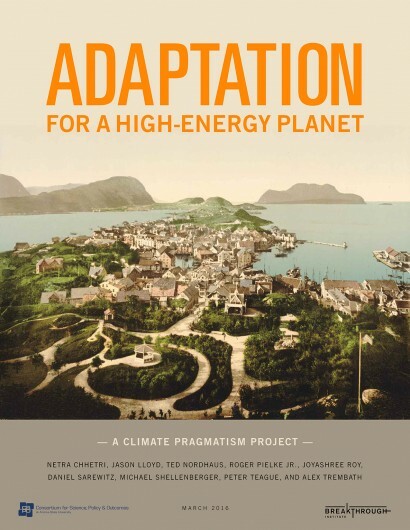 The goal laid out in Adaptation for a High-Energy Planet is simple and can be supported regardless of views about global climate risk: reduce the number of deaths caused as a result of extreme weather and disasters every year, while still accelerating modernization and low-carbon growth on an increasingly high-energy planet. This will require innovative, pragmatic approaches to increasing climate resilience. The report highlights some of these successful adaptations, connects them to robust social and economic development efforts, and explores what they mean for helping communities to thrive in an ever-changing world.